KUALA LUMPUR - City police chief Comm Datuk Seri Mazlan Lazim has denied a Reuters news report that police had raided a luxury apartment said to belong to family members of Datuk Seri Najib Tun Razak. "There is no raid. The police only came to get statements from auxiliary policemen based there following a police report made on a video recording. "We came to check the CCTV footage. "The Reuters story is not true. Fake news," he said last night. He also questioned the sources for the news report. Several people working at the Pavilion Residences apartment said that a police team came by on Saturday afternoon, but they were unsure why the officers dropped by. Two youth leaders of Parti Pribumi Bersatu Malaysia had lodged a police report alleging that vans delivered boxes for 50 Birkin handbags to the apartment on Thursday evening. Reuters quoted two unnamed senior police officers as saying that the police searched for sensitive documents which the Pakatan Harapan government fears may be taken out of the country. Police said they were acting after a complaint that a government vehicle had delivered dozens of boxes made to carry designer handbags and other items to the apartment for Datin Seri Rosmah Mansor. About 20 police officers were seen entering the apartment block, aided by at least a dozen other plainclothes officers. "The Government is worried they could be sensitive and important, and could be taken out of the country." 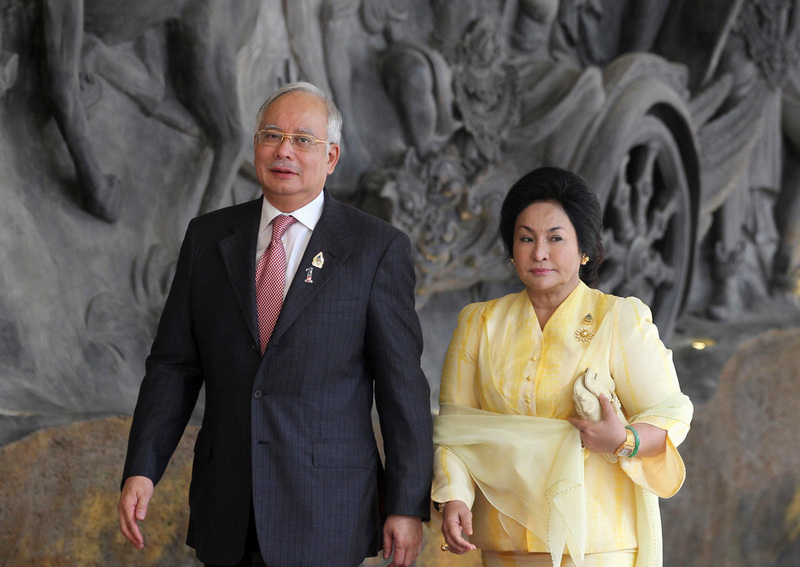 According to the police, members of Najib's family had been staying at the apartment, but they declined to name them. The senior police officer only confirmed "family members" of Najib had stayed in the apartment complex. Prime Minister Tun Dr Mahathir Mohamad has vowed to probe the loss of billions of ringgit from 1MDB which was founded by Najib. Pakatan Harapan chairman Tun Dr Mahathir Mohamad has officially been sworn in as Malaysia's seventh Prime Minister. Dr Mahathir took his oath of office as Prime Minister before Yang di-Pertuan Agong Sultan Muhammad V at the Istana Negara at 9.57pm Thursday (May 10). This means that Dr Mahathir will be the world's oldest prime minister and the first Malaysian to be premier twice. At a press conference earlier, Dr Mahathir said he would appoint Dr Wan Azizah as deputy prime minister once he is sworn in. Dr Mahathir received the mandate to form the government through Pakatan, which managed to wrest 113 out of 222 federal seats in GE14. Former Prime Minister Mahathir Mohamad speaks to reporters during a press conference at the Sheraton Petaling Jaya Hotel on 10 May 2018. Mahathir Mohamad holds up a document with the signatures of alliance party leaders naming him as the prime minister during a news conference following the general election in Petaling Jaya, Malaysia, May 10, 2018. Najib leaves after a news conference on May 10. Malaysia's outgoing Prime Minister Najib Razak (R) speaks during a press conference in Kuala Lumpur, Malaysia, 10 May 2018. Mahathir's stunning defeat of the coalition that has ruled the Southeast Asian country since independence from Britain six decades ago means that, at the age of 92, he will become the oldest elected leader in the world. Official results showed that Mahathir's Pakatan Harapan (Alliance of Hope) had won 113 of parliament's 222 seats, clinching the simple majority required to rule. Najib's ruling coalition, Barisan Nasional (BN), had 79. Pic: Barisan Nasional party members watch election results updates at the Barisan Nasional coalition headquarters in Kuala Lumpur, Malaysia, on Wednesday, May 9, 2018. Supporters of Mahathir Mohamad, former Malaysian prime minister and opposition candidate for Pakatan Harapan (Alliance of Hope), celebrate outside the hotel, where Mahathir Mohamad held news conference, in Petaling Jaya, Malaysia, May 10, 2018. Mahathir told a news conference he expected to be sworn in as prime minister later on Thursday. Few had expected Mahathir to prevail against a coalition that has long relied on the support of the country's ethnic-Malay majority. Mahathir has promised to seek a royal pardon for Anwar if they won the election and, once Anwar is free, to step aside and let him become prime minister. Ethnic-Malay Muslims have long tended to support BN for affirmative-action policies that give them government contracts, cheap housing and guaranteed university admissions. Mahathir's alliance, which counts on urban votes and support from the minority ethnic Chinese and Indian communities, had hoped the veteran Malay leader would win over voters usually loyal to BN. That strategy appeared to have paid off. Mahathir's opposition wrested control of key states Johor and Kedah, and reduced BN's grip in strongholds like Sarawak. Tun Dr Mahathir Mohamad arrives at SK Titi Gajah in Alor Setar at 10.55am to cast his vote. The Election Commission said voter turnout was at 55 percent out of the total 14,449,200 voters in GE14 as of 1pm on May 9. Dr Mahathir Mohamad is keeping a positive outlook on voter turnout throughout the day. By 5pm May 9, some 70 per cent of voters had cast their ballots for what has been dubbed "the mother of all elections". The latest polls show a neck-and-neck race to the finish for ruling coalition Barisan Nasional (BN) and opposition pact Pakatan Harapan (PH). Voters still queuing up within the compounds of polling stations nationwide for GE14 were not allowed to vote after the 5pm cut-off time but any voter affected can file a petition to demand a re-election. Malaysian Prime Minister Najib votes at a polling station during the 14th general elections in Pekan on May 9, 2018. Malaysians went to the polls on May 9 in one of the country's closest ever elections which pits scandal-hit Prime Minister Najib Razak against his one-time mentor, a 92-year-old former authoritarian leader. The Barisan Nasional chairman arrived at his polling station Sekolah Sains Sultan Ahmad Shah at 9.20 am together with his wife Datin Seri Rosmah Mansor. Najib was all smiles when he was greeted by other voters who were present at the station. 9.29am: PKR president Datuk Seri Dr Wan Azizah Wan Ismail voted in SK Seri Penanti in Permatang Pauh. After casting her vote, she immediately left and returned to Selangor where she is contesting for Pandan parliamentary seat there. The Barisan chief is in a four-cornered fight for the Pekan seat. (Pic) Barisan Nasional deputy chairman Datuk Seri Dr Ahmad Zahid Hamidi and his wife Datin Seri Hamidah Khamis successfully cast their ballots at the Madrasah Manbail Ulum voting centre at Sungai Nipah Darat. Datuk Seri Liow Tiong Lai and Datin Seri Lee Sun Loo cast their vote at SK Sulaiman in Bentong. PAS president Datuk Seri Abdul Hadi Awang, who is defending his Marang parliamentary seat, arrives at SK Rusila in Marang to cast his ballot. An instruction notice for voters is seen at a voting center on the eve of the 14th general election in Pekan, Pahang on May 8, 2018. Malaysia's Prime Minister Najib Razak (C) offers special prayers a day before the 14th general election at a mosque in Pekan, Pahang, Malaysia, May 8, 2018. Women vote during the general election in Alor Setar, Malaysia, May 9, 2018. People boarding buses back to Malaysia. at Singapore's Golden Mile complex on May 8. This picture taken on May 8, 2018 shows Malaysians gathering at an election rally in Petaling Jaya to watch a telecast of 92-year-old former authoritarian leader Mahathir Mohamad. Voters queue up in the early morning to cast their ballots at a polling station during the 14th general election in Alor Setar on May 9, 2018.